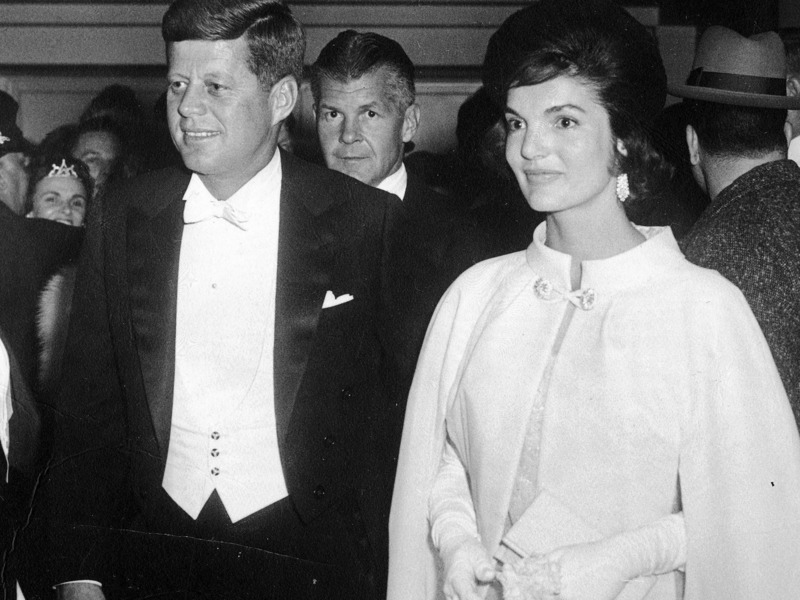 On the night of John F. Kennedy’s presidential inauguration in 1961, Jacqueline Kennedy Onassis attended a celebratory ball in a silk chiffon evening gown and floor-length cape. Indeed, Onassis would go on to become an international style icon. During her time in the White House, and in the years after, she popularized some of the most recognizable trends of the ’60s and ’70s including pillbox hats, tailored coats, and strapless gowns. Since then, numerous celebrities have channeled the former first lady’s chic yet simple style. Take a closer look at some of these memorable fashion moments below. The late Princess Diana often wore pastel suit dresses that closely resembled some of Onassis‘ most famous looks. On May 7, 1995, Princess Diana attended a ceremony for the 50th anniversary of VE Day in a powder blue long-sleeve top and pencil skirt. Diana’s ensemble was nearly identical to the outfit Onassis had worn to an Easter service on April 2, 1961. The royal even paired her look with a pillbox hat and multi-strand pearl necklace — both of which were staples in the former first lady’s wardrobe. Like the former first lady, Diana did not shy away from bright colors. The famous royal donned a pink short-sleeve suit dress during a visit to Argentina in November 1995. More than 30 years earlier, Onassis was photographed at the White House in January 1961 wearing a similar two-piece set. Both tops featured oversized buttons, and both women accessorized with large statement earrings. Kate Middleton is another royal who has taken a page out of Onassis‘ style book. In May 1961, Onassis was photographed at the Washington National Airport — now known as Ronald Reagan Washington National Airport — in a collared coat with oversized buttons, gloves, and a structured hat. Middleton attended an Easter service in April 2017 in a similar collared ensemble, though her coat was a bit more modern with a cinched waist and A-line silhouette. The Duchess of Cambridge also accessorized with a pillbox hat that looked straight out of Onassis‘ closet.